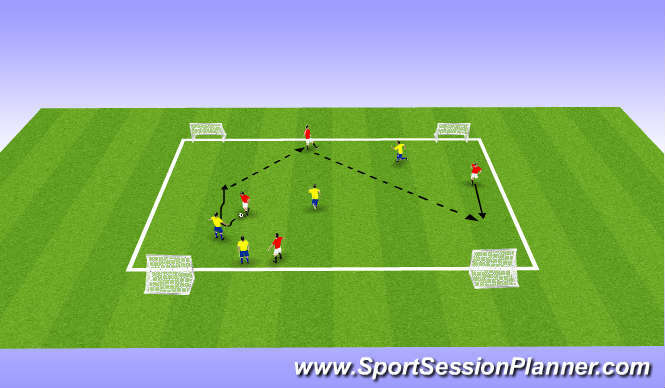 Instruction: Two teams of 6 and a Goalkeeper playing free game. 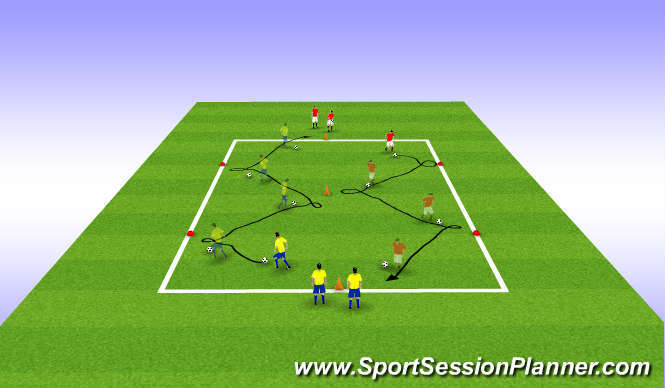 Organization: 2 groups of 3 players working in zigzag movement between the 7 cones. Instruction: The player on the ball practices the inside- and outside hook spin off turns in a zigzag movement between the cones. Coaching points: Insidehook - Stop the ball and place the inside of the foot over and behind the ball whilst rotating and lowering the body. Drag the ball with the inside of the foot in the other direction. Outside hook - Place the outside of the foot over and behind the ball whilst bending the knee of your standing leg to remain in balance. Place that leg behind the ball and take the ball with outside foot in the other direction. Progression/variation: work only right foot. work only left foot. alternate between both feet. Organization: 2-4 players work individually in a triangle. Coaching Points: work in both directions/ Left & right foot. Distance to ball. Placement of non kicking foot. Accelerate away. 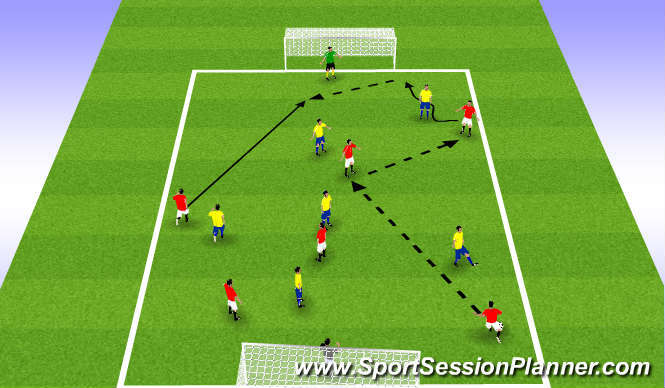 Instruction: A-The player in yellow passes the ball to the red player on the opposite side. The red player receives the ball and dribbles to either the big cone on the right or the left in front of him. The yellow player reacts accordingly and presses the ball without tackling him. the red player uses the inside- or outside hook to spin away from the yellow player. Both players change positions and then the excercise repeats itself. 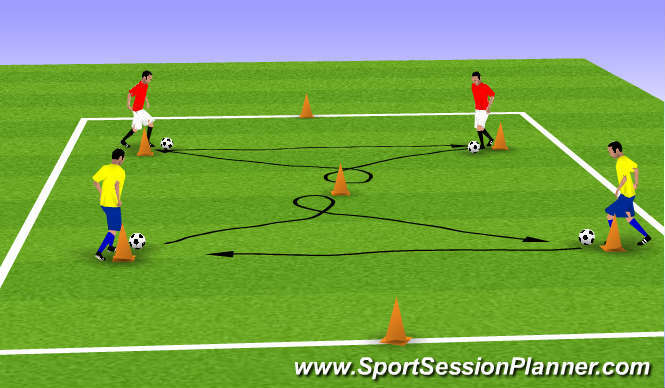 Progression/variation: B - Challenge the players to dribble to both cones to make to spin off moves. after the first spin off, the defender tracks the player on the ball who makes another spin off move to then accelerate away. 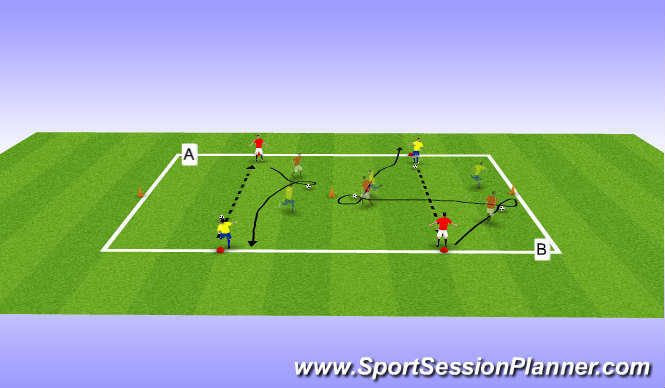 Organization: 2 teams of 4 playing 4v4 on 4 small goals. Area 25x30. Instruction: Team on the ball must try to create scoring opportunities in one of the 2 small goals that the other team defend. They must try to change the angle of attack by using spin off moves and switches of play. Coaching Points: encourage the skills, movement and switching play.